Along with their new ThinkPad Ultrabooks, Lenovo also announced their new LT2934z panoramic display today in Berlin, Germany prior to the start of IFA. 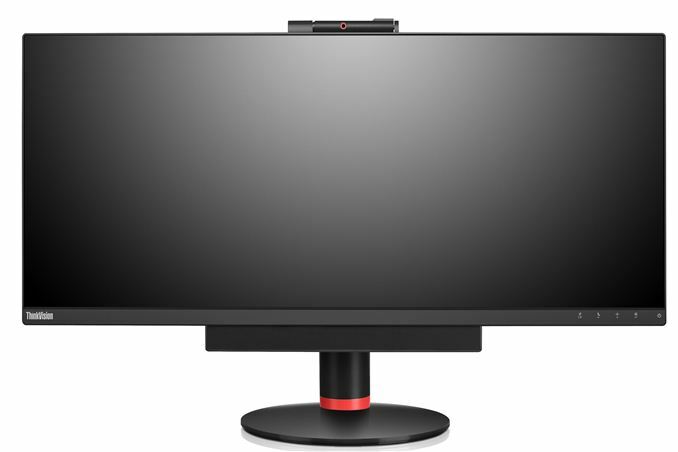 This is a 29” 21:9 aspect ratio display similar to the LG 29EA93 monitor we looked at earlier this year, only with the stand and other features designed and packaged by Lenovo. While Chris wasn’t particularly impressed with the initial LG display, the updated firmware solved every major complaint and turned it into a very compelling product. Lenovo’s LT2934z will hopefully keep all of the good aspects and merely add to it. Core features include an AH-IPS panel, full HD webcam, dual array microphone, and stereo speakers. It also has picture-in-picture functionality. The backlight is rated at 100% sRGB gamut, so perhaps not ideal for professionals but great for “the rest of us”. The native resolution is 2560x1080, with the normal 178 degree viewing angles that IPS provides. Adjustment options include tilt (-5°/+25°) and swivel (+/-45°), as well as 110mm of height adjustment (if I’m reading the spec sheet properly – it says “110mm Lift”). Video connectivity consists of VGA, HDMI 1.4, MHL, DL-DVI, and DisplayPort 1.2. The LT2934z also includes two USB 3.0 ports (one with BatteryCharge 1.2, so it’s always powered) and two additional USB 2.0 ports. The display weight 18.3 lbs. (8.3kg) and measures 26.5”x11.2” (673mm x 284mm). Also included are dedicated VoIP keys for mute, pick up/drop call, and volume. The LT2934z is scheduled for availability starting in October 2013, with pricing starting at $799. That’s $100 more than the LG 29EA93, but hopefully with the extra features making it a worthwhile upgrade. Good 2560x1440 27" IPS panels are now firmly into the $400-500 range, with the super budget ones even getting below $400 (like Monoprice's), albeit at the cost of some features. Even 30" 2560x1600 panels are starting to hit <$800. Given general VESA compatibility an included stand isn't worthless but not it's not a massive feature either, and that seems to be about all this has going for it. I did consider home theater enthusiasts, but I then discounted it too, because this isn't a big TV. In a 60"+ display sure, the argument that it's for the living room and oriented around video is clear. But this is for the desktop, and there the argument seems a lot more dubious. Unless the black levels are awful, black bars are not a problem (if anything they can be useful in circumstances like watching foreign video with subtitles). "Personally, I'm sticking with my 30" display(s) until they go belly up. Heh."